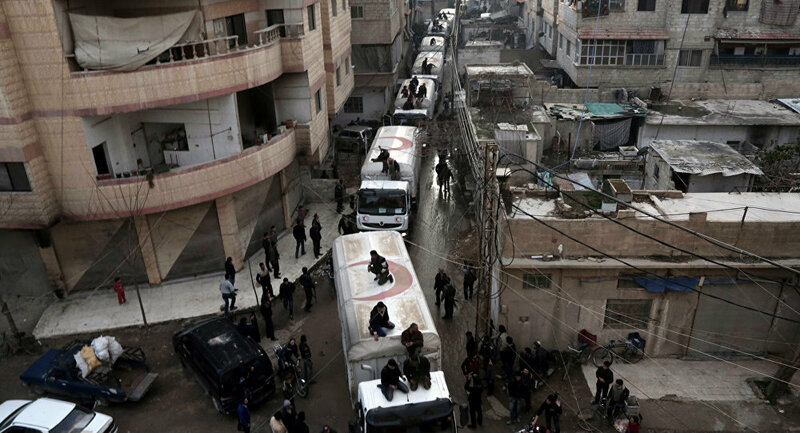 International Committee of the Red Cross (ICRC), Syrian Arab Red Crescent (SARC) and UN humanitarian trucks have entered the besieged Syrian towns of Madaya, Zabadani, Fuah and Kafarya, the ICRC Delegation in Syria said. MOSCOW (Sputnik) — Madaya and a part of Zabadani are currently held by groups opposed to the Syrian government but are deep within government-held territory close to the Lebanese border. Fuah and Kafarya are the only government-held towns in a vast opposition-held area in the Idlib province. The towns of some 20,000 people have been under siege since 2013. "#HappeningNow: we are entering #Madaya, #Zabadani, #Foaa & #Kafrya with @SYRedCrescent & @UN delivering much-needed food & medical items," the ICRC said in its official Twitter account late on Tuesday. — ICRC Syria (@ICRC_sy) 14 марта 2017 г. ​The humanitarian situation in the four towns has sparked serious concerns over the past year, with the population lacking basic necessities and food. In February, Jan Egeland, a senior adviser to the UN special envoy for Syria, said the populations of these towns were likely to face starvation unless humanitarian access was established soon. The civil war in Syria has been lasting for six years with the government troops fighting against numerous opposition factions and terrorist organizations, such as Daesh, outlawed in Russia. The nationwide Syrian ceasefire regime was introduced on December 30, 2016, with Russia and Turkey being its guarantors. Terrorist organizations are not part of the ceasefire.